People walk into Google’s New York offices. Google is in the midst of controversy – and possible legal action – over its decision not to disclose a glitch in Google+ that left users’ data exposed. Google announced on Thursday that it’s adding new features to Google+ for businesses – just days after Google shuttered Google+ to the general public after reports that it had left personal data exposed. “Over the past year, we’ve been building a new experience that’s designed specifically to meet the needs of large organisations with distributed workforces,” David Conway, product manager at Google, said in a blog post. GoogleGoogle announced a custom streams feature for businesses in Google+. For example, with the new features, admins can bulk-add entire groups to a Google+ community, easing the process of onboarding users. They can also view engagement metrics for employees’ Google+ communities. 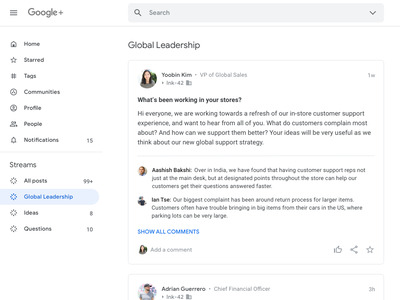 Later on, Google plans to roll out a feature for admins to review and moderate posts by employees, if needed.